Aquaculture is a part of life here in the Pacific Northwest. So it was only natural that working closely with the aquaculture Industry from the moment we opened our doors over 40 years ago, seamed like the most natural place to start! Since then we've learned a thing or two about the aquaculture industry and we molded our process (pun intentional) around these needs. We have led the way in bio-security of aquaculture sites, realizing that the protection of your aquaculture business means you have to rely on the products that protect your sites. We work tirelessly with our aquaculture partners ensure this is the case! "Partnership" - it used to mean something, at least, it did back when we first started using it 40 years ago. So it has a bit of a different meaning to us than most. To us it means sticking together, doing what you say you will do, delivering on your promises, and making it right when an opportunity is missed. This simple operating philosophy means that when we partner with your industry we are there to be deeply integrated in their process, making your needs, our needs. We routinely design cost effective, viable solutions with bio-security in mind. 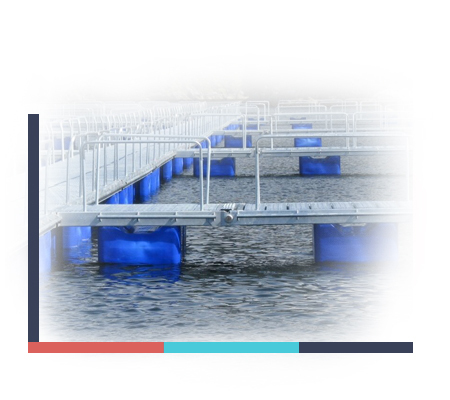 Over the past 40 years we have delivered many different products to our Partners in the aquaculture industry including; net pens, oyster floats, compensation buoys and various bio-security solutions. What's more is we think you'll be hard pressed to find a partner with more experience in your industry. Our team has delivered over 150 man years of experience between our design and development group, production management and supervisors. That's a lot of years! That translates to a team that can facilitate design, engineering, development and manufacturing of your critical components, and deliver them from a reliable source with the track record to prove it. Not In The Aquaculture Industry?